The tenth World Cup nears its conclusion and, at the quarter-final stage, the eight remaining teams were all Test-playing countries. The preliminary stage over, none of the Associate nations of Ireland, Afghanistan, United Arab Emirates and Scotland remain in the competition yet it is these Associate nations which have again been the focus of attention. Rightly so as I am sure that I am not the only fan who has enjoyed their performances. 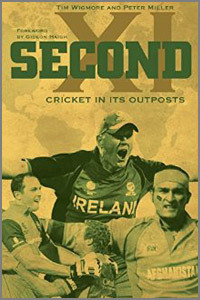 The launch, therefore, of Second XI: Cricket in its Outposts, just before the start of the World Cup was not only ideal for fans but very clever. With pressure from many quarters being put upon the I.C.C to allow more Associate nations to compete in the next World Cup in 2019, much of the focus has been on many worthy performances by the Associate players. There may not have been many shocks but many individual performances must have given hope for their participation in 2019. This book is the ideal companion to accompany readers and followers of the World Cup. With their journalistic backgrounds, Tim Wigmore and Peter Miller – with an added chapter and Foreword by the ever-cerebral Gideon Haigh to further enhance the book’s quality – Second XI, through the admirable research of the authors, takes us through the participating Associate nations in the current World Cup through the ones who didn’t make it this time to the aspiring nations. Through their interviews, we all get a much better understanding of what it must be like to take the grand stage against the big boys and showcase their skills. We also learn what these players have been through and, in some cases, the hardships suffered to make it. One can only imagine their pride. Mohammad Nabi spent his first sixteen years as a refugee in Pakistan. He is now Afghanistan’s captain and they are now on the list of World Cup victories. The evergreen U.A.E player, Khurram Khan, is a flight purser for Emirates and, at the age of 43, made his debut in this tournament. He may take heart that he is not the oldest player to compete in the World Cup, that honour belonging to the Dutch player, Nolan Clarke, who made his bow at the age of 47. Maybe 2019 beckons for Khurram? Ireland have made great strides since 2007, five of their players having made World Cup centuries. Who can forget Kevin O’Brien’s pyrotechnics at Bangalore in 2011 when Ireland successfully chased 329 to make the record highest winning second innings total? They seem to have a good process in place and know where they are going. Middlesex stalwart, Tim Murtagh, made the move to return to Ireland and was not initially selected, a decision he was in favour of. Places were to be earned. Maybe those who have crossed the waters to England may, like Ed Joyce, also return to play for their native country. Kenya made a huge impression in the 2003 tournament reaching the semi-finals and, although they have not participated in the 2015 tournament, theirs is an impressive record. Through the efforts of Tim Wigmore, Peter Miller and Gideon Haigh, this book is thoroughly worthwhile for anyone wanting to know more about the Associate nations. With chapters on Afghanistan, Ireland, U.A.E, Scotland, The Netherlands, Kenya, Papua New Guinea, Nepal, China and the U.S.A, this is an excellent book to find out so much more about the countries and players who have given so much pleasure over the last month.